The International Commission on Peace and Food was established as an initiative of the MSS in 1989. The Commission focused on evolving solutions to pressing global issues related to international security, global governance, employment, food security, transition in Eastern Europe and human development. Uncommon Opportunities In October 1988, The Society conducted a small conference of distinguished persons in Washington D.C. to discuss a proposal to establish a new international initiative to promote disarmament and defense, food production and employment generation. As a result of the recommendations of the participants, the International Commission on Peace and Food (ICPF) was established in early 1989 headed by Dr. M.S. Swaminathan, internationally renown scientist, former member of the Indian Union Planning Commission, and first recipient of the World Food Prize, with Garry Jacobs, Vice President of MSS, as Member Secretary, and Robert Macfarlane, Treasurer of MSS, as Treasurer. The Commission con­sisted of 30 international experts on food, development and peace issues from 20 nations and included three staff members of the Soci­ety. Over the next five years, ICPF conducted seven international conferences and set up five working groups to study issues related to The Commission focused on evolving solutions to pressing global issues related to international security, global governance, employment, food security, transition in Eastern Europe and human development. In addition, it undertook country specific research projects in Russia and India. Commission members included former US First Lady Rosalynn Carter and Queen Noor of Jordan; James Ingram, Director General of UN World Food Program; Dr. Dragoslav Avraomic, former Director of the Brandt Commission; Dr. Abdus Salam, Nobel Laureate in Physics and President of the Third World Academy of Sciences; Umberto Colombo, Minister of University and Scientific Technical Research, Government of Italy and former Chariman of Italian Atomic Energy Commission; Dr. Alexander Niconov, President of the All-Union Academy of Agricultural Sciences and Dr. Victor Nazarenko, Director of the Russian Institute for Information and Techno-economic studies of the Agro-Industrial Complex of USSR; Dr. Martin Lees, President of the UN University for Peace in Costa Rica; Dr. Lal Jay­awardena, Director of the UN World Institute of Development Economic Re­search in Helsinki; Brian Walker, Director of Earthwatch Europe; John Mellor, Director of the International Food Policy Research Institute in Washington D.C.; Eugene Whelan; former Canadaian Minister of Agriculture; Uma Lele, World Bank economist; Mary King, former Asst Director of the U.S. Peace Corps; Jasjit Singh, Director of the Indian Institute of Defense Studies and Analysis in Delhi; Erling Dessau, Resident Representative of UNDP in India; Edward Williams, Winrock International, USA; Dr. Manfred Kulessa, former Managing Director of German Development Service; Dr. A. T. Ariyaratne, President of Sarvodaya Shramaana in Sri Lanka; Garry Jacobs, Robert Macfarlane and Robert van Harten of the Mother's Service Society; and others. Between 1989 and 1994, the Commission conducted five plenary meetings of its members, which the Society helped to organize and support financially. The first was conducted at the International Centre for Theoretical Physics in Trieste, Italy in October 1989 in collaboration with the Third World Academy of Sciences. At that meeting the Commission approved its terms of reference and plan of work for the next five years. An interim meeting of ten Commission members was organized and sponsored by the Society in Washington DC on April 28, 1990 to review progress since the Trieste meeting, to identify countries for ICPF's research work, and to discuss the outlines of a Global Compact for Ecological Security. The second full meeting of the Commission was hosted by the All-Union Academy of Agricultural Sciences in Moscow in November 1990. In addition to Commission members, 25 Soviet experts on agriculture, economics and military conversion were invited to present papers and discuss the impact of economic changes on the USSR. This meeting focused primarily on strategies for economic transition in Eastern Europe, agricultural development and establishment of market mechanisms, efforts to reduce military expenditure and the proposal to establish a World Army. The Society sponsored the third plenary meeting of the International Commission On Peace and Food in Madras from October 2-4, 1992, for which approval was granted by the Department of Economic Affairs of the Ministry of Finance. Fifteen delegates from around the world joined with ten distinguished Indian delegates to discuss critical issues related to development, environment and defense. The Society's study of employment potentials in India was presented at the meeting and endorsed by the participants. The terms of reference were formulated for second phase of the study. Participants also framed a proposal for presentation at the UNCED Conference in Rio de Janiero calling for establishment of employment guarantee programs emphasizing environmental projects such as afforestation, wasteland de­velopment, biomass utilization and watershed management. The Governor of Tamil Nadu hosted a special dinner for the participants. The fourth plenary meeting of the Commission was hosted by the Norwegian Agricultural Research Council in Oslo in September 1992. Here attention focused on issues related to the first Gulf War and the on-going war in the former Yugoslavia. The fifth meeting is being hosted by the Carter Presidential Center in Atlanta, Georgia, USA during October 1993. At this meeting, Society staff presented the findings of the working group on Employment and strategies to shift from competitive to cooperative global security paradigm. Under the auspices of ICPF, The Society undertook a major study in 1991 to access the long term employment needs of the country and to identify possible strategies to meet those needs, focusing on the potentials for increasing productivity and employment in agriculture and agro-industry. The research team, headed by Dr. G. Rangaswami, conducted in-depth studies of technical and commercial potential in 8 sectors of agriculture including horticulture, sugarcane, cotton, aquaculture, sericulture, oil seeds, food grains, irrigation and wasteland development for plantation forestry and fodder pro­duction as well as examining opportunities for growth of dairy, poultry and plantations crops. These studies accessed the scope for upgrading technology to increase productivity, expanding pro­duction, improving quality, domestic and export market potential, economics of production, links with processing, and organisational mechanisms to encourage growth in these sectors. The sectoral studies were then amalgamated to assess the overall potential im­pact of these potentials on employment in agriculture, agro-indus­try and downstream businesses, the estimated investments required by government, banks and private sector, the profits and jobs that would be generated by large scale implementation. The findings of the study indicate that it is possible to create 100 million new jobs in India within a ten year period through intensive develop­ment of commercial agriculture and agro-industries. The study pro­jects creation of 45 million direct jobs in agriculture, 12-15 million jobs in direct downstream agro-industries and another 40 million in other rural and urban enterprises. The average cost of new jobs in agriculture and agro-industry works out to Rs 20,000, compared with Rs 2,50,000 in the private sector. The strategy could generate an additional Rs 200,000 crores of GDP, equivalent to a 37% increase at constant prices. The relatively low capital outlay would make it possible to finance the direct costs of the program within the present budgetary limits of the five year plans. The findings of the study were presented for review and discussion at ICPF's plenary meeting in Madras in October 1991. A seminar was organised in collaboration with the Institute of Rural Management at Anand dur­ing November 1991 at which 25 leading politicians, economists, planners and heads of voluntary agencies reviewed and endorsed the strategy and proposed appropriate mechanisms for its adoption and implementation by Government. The strategy and recommendations were presented to senior officials in the Government of India, in­cluding the Prime Minister and his Additional Secretary, the Dep­uty Chairman and three members of the Planning Commission, the Minis­ter and Secretary of Agriculture. In February 1992, the Planning Commission officially adopted the strategy and it was incorporated in the Eighth Five Year Plan document and the Finance Minister's 1992 Budget. As its first practical step, the Government decided to es­tablish the Small Farmers Agri-Business Consortium to implement the strategy in 12 model districts around the country. Implementation studies have been launched in Pune District of Maharashtra, Dharmapuri District of Tamil Nadu and other places. In December 1990, a research team visited Moscow and an agricultural region in Northwestern Russia on a pro­ject organized by the All-Union Academy of Agricultural Sciences of USSR to develop a strategy to promote the development of private family farming in the country. The study included visits to private and state owned farms in Pytalova District, Pskov Region, as well as discussions with economists and agricultural specialists in Moscow at the Academy of Agricultural Sciences, The Agrarian Institute, and the Ministry of Food Procurement. Pytalova District was the first in Russia to introduce pri­vate farming. At the time of the study there were 147 private family farms in the district, but there was no social or economic infrastruc­ture to support their development and activities. The objective of the project was to identify effective strate­gies for promoting the develop­ment of private farms in Russia. The study team concluded that India's experience in Green Revolution and White Revo­lution was highly relevant to Russia today. At a critical juncture when Russia was suffering from an acute shortage of wheat, the Society submitted a proposal to the Government of India to sanction food aid to Russia and the Government of India offered one million tons of wheat for immediate delivery. An article entitle "Marshall Plan for Russa" was published in The Hindu in December 1990. In March 1991 The Society sponsored the visit of a Soviet research team to examine India's achieve­ments in dairy development and explore potentials for collabora­tion between India and USSR on development of a private dairy industry in USSR. The Soviet team was headed by Dr. Rudolph Praust, Head of the Pytalova Rural Observa­tory of the Agrarian Institute. The team had discussions with Dr. V. Kurien, the Chairman of the Na­tional Dairy Development Board, offi­cials in the Ministry of Agriculture and ICAR, and a private dairy busi­nessman in Delhi. They visited the Anand Dairy in Gujarat, the Bharat Agro-Industries Founda­tion in Pune and NDDB's fruit and vegetable pro­ject in Delhi. Following this visit, a delegation of private Indian businessmen visited Russia to continue discussions. Follow-up discussions were held in Moscow in 1992. Three research staff of the Society participated in a study mission to Russia organized by the International Com­mission On Peace and Food in collaboration with the Russian Insti­tute for Information and Technical-Economic Analysis of the Agro-industrial Complex. The purpose of the mission was to examine con­ditions at the district level in a agro-climatically representa­tive district of Northwestern Russia in order to identify effec­tive strategies for stimulating agricultural and rural develop­ment, drawing on the team's experiences in developing countries like India. The mission team met with senior officials in the Rus­sian Ministry of Agriculture and several economic research insti­tutes, as well as district officials, bankers, state and collec­tive farm managers, private family farmers and managers of indus­trial enterprises. The team found that despite the macro level ef­forts of the Russian government to stimulate development through privatization and liberalisation, conditions at the local level were severely lacking in the institutional infrastructure required for rapid development--extension services, agro-supply services, rural banks, local processing and storage facilities, marketing organisations, and rural industries. 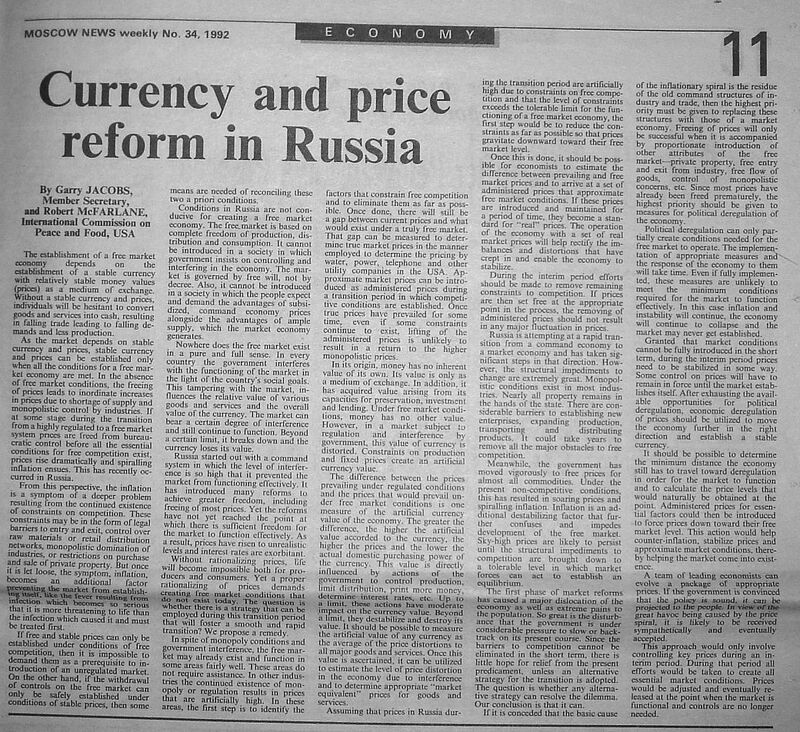 Articles were published in Moscow News on "Lessons of the Economic Transition in Russia" and "Currency and Price Reform in Russia." A working group including three members of the Society was formed to continue research on strategies to accelerate the economic transition in Russia. 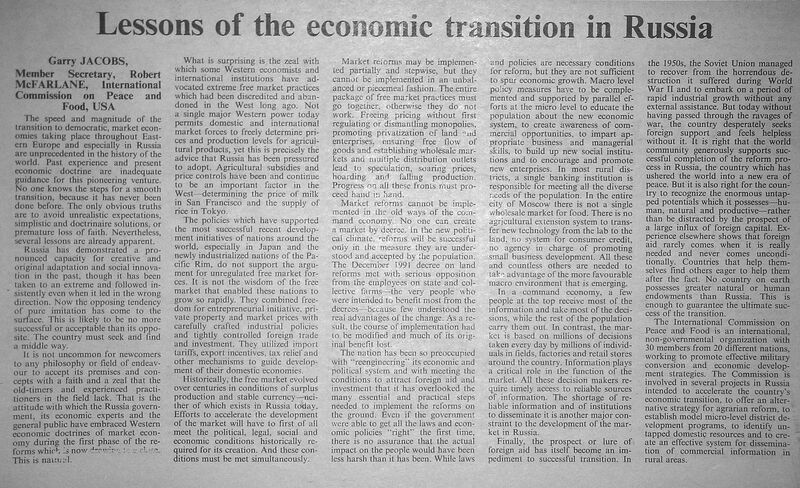 A conference on the Transition in Russia was organized in collaboration with the Gorbachev Foundation and the Agrarian Institute of Moscow in January 1993. 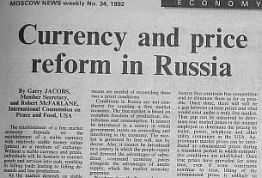 A working group including three members of the Society's research staff completed a draft report in June 1993 on strategies to accelerate the economic transition in Russia. Former Soviet President Mikhail Gorbachev chaired the conference. In the aftermath of the war in Yugoslavia and the blockage of Serbia by Western powers, Serbia suffered from hyperinflation in the range of one million percent, perhaps the highest level ever recorded anywhere. After discussions with society staff, Dr. Dragoslav Avramovic, former Director of the Brandt Commission and a member of ICPF, was appointed as President of the Federal Bank of Yugoslavia. Applying a strategy proposed by a Russian Commission member during Gorbachev Foundation Conference, inflation was brought down to single digit levels within one or two weeks in Serbia, a previously unimaginable achievement. ICPF was officially wound up in early 1995 and succeeded by the International Center for Peace & Development, based in Napa, California with Harlan Cleveland as Chairman and Garry Jacobs as Executive Director. The objectives of ICPD is to carry on the work begun by ICPF. In 1995 ICPF collaborated with the Noor al Hussein Foundation in Jordan to organize an international symposium on employment strategies in the countries of the Middle East. ICPF's final report was published by Zed Books, UK in September 1994 and formally released the following month by Harlan Cleveland, President of the World Academy of Art & Science at the WAAS General Assembly in Minneapolis, by James Grant, Administrator of UNDP in New York, and by Frederico Mayor, Secretary General of UNESCO in Paris. In December 1994, the report was formally submitted to the UN by the Government of Jordan and presented to the UN Secretary General Boutros Boutros-Ghali by Queen Noor of Jordan. An international symposium was conducted in New Delhi on November 19-22, 2004 to examine the relevance in today's world of recommendations contained in the report of the International Commission on Peace & Food, Uncommon Opportunities: Agenda for Peace & Equitable Development, which was submitted to the UN in 1994. The conference was inaugurated by Dr. A.P.J. Abdul Kalam, President of India. The keynote address was delivered by Mr. Natwar Singh, Minister of External Affairs. The meeting was co-sponsored by MSS, the International Centre for Peace & Development (USA), the M.S. Swaminathan Research Foundation (India), the National Farmers Commission (Government of India), the UN World Food Program and the World Academy of Art & Science. The conference explored the inextricable mutual interdependence between peace, social stability, democracy, employment and food security. The conclusions of the Delhi meeting will be examined further at an international symposium on nuclear disarmament and terrorism in Washington DC in September 2005 and during the General Assembly of the World Academy of Art & Science in Zagreb, Croatia in October 2005.